Hello everyone! We had another creative afternoon at Papa San. Before I download the pictures, I have to tell you about Linda’s Dye Your Own experience. She dyed a couple of skeins today, with great results. One skein looks like the inside of a mango. Can’t wait to see them—she said it was really easy and mess-free. Bring them Sunday Linda! Here is Cheryl on the left and Shirley on the right. 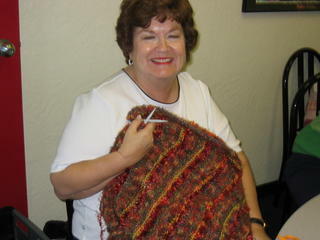 Cheryl is knitting a baby blanket out of a fluffy, yummy yarn. It looks like it could float in the air. 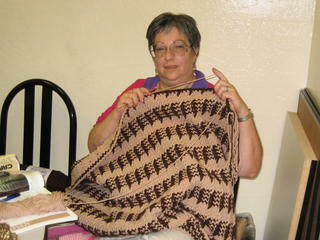 Shirley started her Firenze scarf last week. She frogged it back to the beginning and started over aqain. 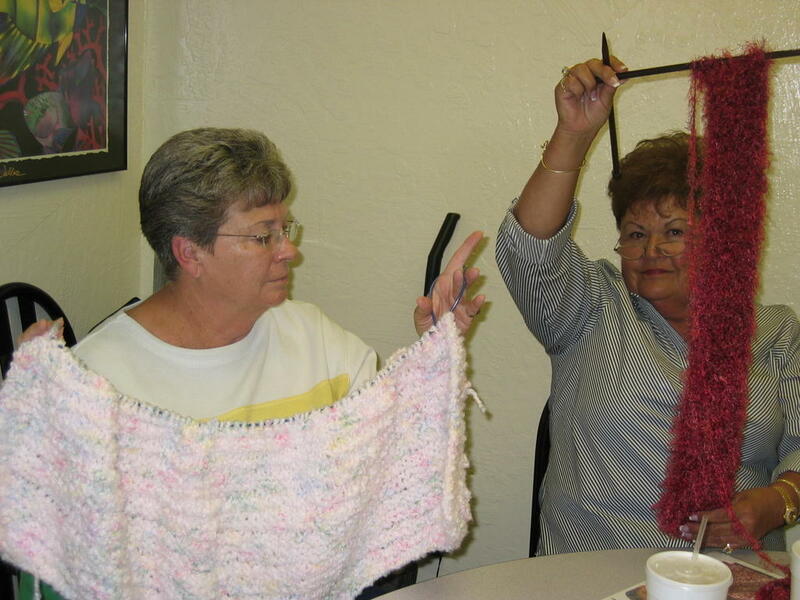 Knitting trivia—Frogging is a term used when you rip out a lot of stitches i.e. (“rippit, rippit similar to ribbit-the sound a frog makes”). 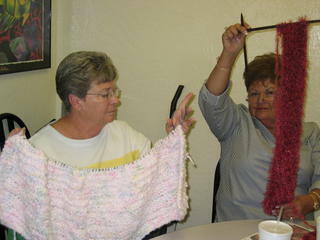 When you tink, you take out one stitch at a time, usually using your needles to “un-knit”. Tink is knit spelled backwards. The yarn Shirley is using is soooooo nice and soft, it will feel great against someone’s neck. Here is Judy with her throw. Wait until you hear her story. You know, the more you knit, the more you incorporate your life story into your project. Years later, you remember that part of your life while you were creating your project. You recall trips you took while knitting it, what was happening in the world and in your life during this time. If Judy’s throw could talk, what a story it could tell! Someone passing by Judy’s car saw her knitting bag. They broke her window and stole the bag. She was heartbroken when she found it missing, as you can imagine. Someone found it, with it’s contents strewn down their alley, including her Denise needle set and her gear bag with accessories. The throw was off of the needles. These people found a receipt from Michael’s, and went there to see if the manager would be able to trace the owner from the receipt. They did not want to assist in the hunt. The people went to YPD to see if anyone had reported the theft, to no avail. They called the paper, and the person they talked to recognized the description of the bag because Judy had just called to place an ad. What a story! Today, she put it all back on the needles and is ready to continue. There are some wonderful people out there who admired the project and knew that she would be missing it terribly. Bless them! Here is our newest member, Beth Masse. Check out this afghan. It is absolutely gorgeous. You have to see it in person next Sunday. It looks great on the reverse side too. It is all crochet, and has cables. Beth crochets and knits. She is one of the managers at the new Joann’s store in Yuma Palms. Joann’s officially opens this Friday. Word is that they may have a “soft opening” a couple days early. So fellow knitwits, we need to keep up the patrol! I have made several reconnaissance trips by there the past week, but now we have some inside information! Beth says that all of their merchandise is beautiful, and they are well-stocked. They are not considered a super-store, but they have almost all the same things that a super-store carries. I know that we are all anxiously awaiting their opening. This is THE week! Welcome Beth, we are glad you came! PermalinkMickey Kaus: ‘Sexual Confidence’ at Record High! 09/16/05 David Segal on John Gotti’s trial.< HREF="http://www.autopilotbiz.net" REL="nofollow">cheap dsl <> related site.